Yesterday at work my whole class was treated to a cocpop. (Coke, Popcorn Chicken) by Bona’s mother. 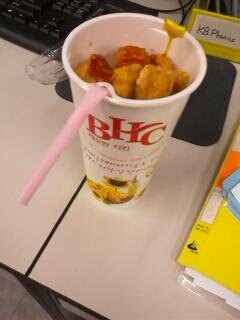 BHC Chicken, which they swore to me stood for nothing…I was hoping Boss House Chicken or something cool like that, has a snack pack type meal. It comes in a togo cup, not any bigger than a medium size coke at mcD’s the bottom half has fanta or cola inside and the top has a small cup that fits just perfect above the liquid and holds mini chicken nuggets that taste a lot like cafeteria playdoh nuggets. There is a perfect hole through the nugget plastic part into the soda for a straw. For less than $2.00 KFC popcorn chicken may never win in the Gwangju snack pack race.